It’s time for a change, for something new. Currently, there are at least 70 manufacturers of what might be called Case Management Systems for customer contact centers. The function of a CMS product is to capture and track the details of a customer interaction with the company, to record the specifics of a request or problem and to help the support or service rep find a satisfactory resolution. Obviously, a good CMS resource is key part of the standard contact center technology suite, a requirement for any company that wants to be effective. However, the implementation and use of a CMS application, while it can help you to manage cases, will not guarantee effective management of the center itself. A customer contact center is essentially a knowledge inventory and distribution operation. There are associated costs for every aspect, just as there are for any business function. The lack of a true center management system has had very bad effects even for those operating under the long outworn idea that support & service ought to be run as a cost center. 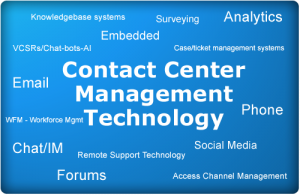 For those seeking to take advantage of the huge profitability potential of their contact centers, the lack of appropriate management technology has been a significant barrier to success. It’s time for a change. For far too long, Support and Service professionals have been, at best, barely second-class citizens in their corporate communities. There have been a couple of major reasons for this scenario; the fact that they weren’t associated with an income stream and identifiable contributions to overall corporate profitability goals is the first barrier to be overcome. Over the years, the software industry has learned how to handle the cost accounting for engineering, marketing and sales reasonably well. Now we need to take the first step on the path towards profitability by accurately determining the actual costs and revenue of Support. The initial phase of the contact center management technology research project involves surveying the various case management system manufacturers to determine what, if any, appropriate profitability metrics measurement and accounting functionality they may have included in their products. I’ve gotten some very interesting replies from some of them already, indicating that the possible extension of their products is definitely being seriously discussed. I’ve also begun assembling and working with a team of very senior support professionals to create a specification for a Profitability Module that should be an inherent part of any case management system. If you’re a CMS manufacturer, please let me know what you currently include in your product’s functions and what you may be planning to include in upcoming releases. Support professionals interested in working with the specification design team should also contact me. What the team will produce is a set of specifications that the manufacturers can then use to bake profitability management functionality into their products. It’s time for a change; are you ready to be a part of it?